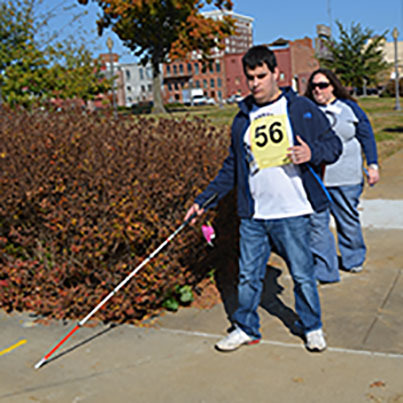 A Cane Quest participant uses orientation and mobility skills to navigate in downtown Muskogee during last year’s competition. MUSKOGEE, Okla. – Oklahoma School for the Blind expects 32 young white cane users to compete in their sixth Oklahoma Regional Cane Quest on Thursday, November 15. Cane Quest challenges students to use proper travel techniques and cane skills to complete routes in their communities. The competition is a national program of the Braille Institute of America, based in Los Angeles, California. Students from across Oklahoma will compete to earn points and win prizes. Contestants in grades two through six will compete on the OSB campus with a volunteer teammate from the community to demonstrate proper cane techniques, self-protective methods, search for dropped objects and human guide skills. They will earn coins for skills they demonstrate and use those coins to buy prizes. Contestants in grades seven through twelve will compete near the Muskogee Civic Center in the downtown area. They will earn points for demonstrating advanced skills, such as street crossings, asking for directions and negotiating sidewalks. “Cane Quest not only gives contestants the opportunity to show off the orientation and mobility skills they are learning, but gives members of the community the opportunity to see how independent the contestants are,” said Faye Miller, OSB certified orientation and mobility instructor and Cane Quest regional organizer. “Contestants are motivated to practice their skills for the contest, but benefit long term from better independent travel skills,” she said. OSB staff and trained volunteers will monitor contestants at all times. The school is a division of the Oklahoma Department of Rehabilitation Services. For more information about OSB or Cane Quest, phone toll free 877-229-7136.